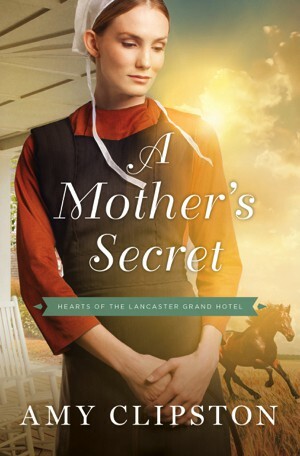 In A Mother's Secret—the second book in a new Amish series by bestselling author Amy Clipston—Carolyn Lapp dreams of marrying for love. But will the errors of her past destroy this dream forever? Carolyn Lapp longs to have a traditional Amish family. But she lives on her brother's farm with her parents and her 15-year old son, Benjamin. Carolyn has never revealed the identity of Benjamin's father and lives daily with the guilt and shame of her youthful indiscretion. Her brother simply will not forgive her. His answer is to arrange a practical marriage for Carolyn to Saul, a widower with a little girl. But Carolyn isn't convinced that Saul really loves her and believes he is simply looking for someone to help raise his daughter. When Benjamin causes trouble at a local horse auction, horse breeder Joshua Glick decides that he must be taught a lesson. Carolyn and Joshua are unmistakably drawn to each other, but Joshua mistakenly assumes that Benjamin is Carolyn's brother. Carolyn fears that if he discovers the truth, her past will destroy their budding romance. After years of shame and loneliness, Carolyn suddenly has two men vying for her attention. But which of them will give her the family—and the unconditional love—she's longed for? A Mother's Secret was inspired while I was writing A Hopeful Heart. I felt Joshua Glick needed his own story. This book is dedicated to my amazing editor and dear friend, Becky Philpott.